The Azerbaijani Mugham is a traditional musical form, characterized by a large degree of improvisation. The Mugham, though a classical and academic art, draws upon popular bard melodies, rhythms and performance techniques and is performed in many venues throughout the country. Contemporary representations of the Azerbaijani Mugham reflect different periods of Azerbaijan’s history and its contacts with Persians, Armenians, Georgians and with other Turkic peoples. This musical genre shares artistic characteristics with the Iraqi Maqam, the Persian Radif and the Turkish Makams. In the past, Mugham was primarily performed on two secular occasions: the toy, the traditional wedding feast and the majles, a gathering of connoisseurs in private settings. It was also cultivated by members of the Sufi orders and by performers of religious dramas known as ta’zie or shabih. Official competitions and informal contests served to establish the reputation of accomplished musicians. This modal genre features a male or female singer accompanied by musicians playing traditional instruments, such as the tar (a long-neck lute), the kamancha (a four-string spiked fiddle) and the daf (a type of large tambourine). Since Mugham cannot be transcribed in a fixed form, multiple versions are transmitted by masters who train students in the fine art of interpretation to ensure the variety of this artistic expression. 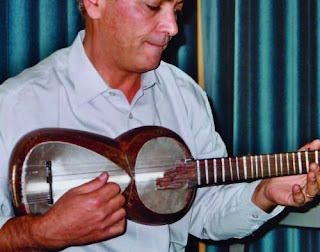 The Mugham has lost some of its aesthetic and expressive characteristics largely due to European influences, which are particularly apparent in the manner in which contemporary musicians perform and transmit their skills to the younger generations.